China now has a bigger voice in international soccer after a deputy minister of the General Administration of Sport was elected to the FIFA Council, the global governing body's main decision-making entity. "China should have its own voice on the international soccer stage," 59-year-old Du Zhaocai told Xinhua News Agency after his election at the Asian Football Confederation Congress in Kuala Lumpur, Malaysia, on Saturday. "We should better promote soccer development in China and Asia and the results of the election are very significant. We can be involved more directly in terms of decision-making in FIFA and the AFC, which will help boost the sport's development in China," Du said. 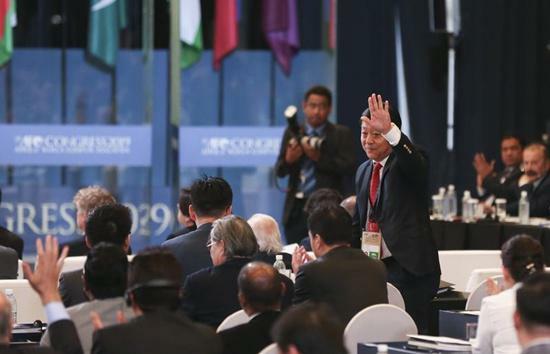 He was among six Asian representatives elected to the FIFA Council for four years. After securing his seat on the council, Du withdrew as a candidate in the AFC vice-presidential race. Using his new position to change China's fortunes on the field of play, however, will be no easy task for Du. Now ranked 74th in the world, Team China's latest embarrassment came at last month's China Cup in Nanning, Guangxi Zhuang autonomous region, during which the men's squad racked up defeats to Thailand and Uzbekistan. That followed a disappointing Asian Cup campaign in the United Arab Emirates in January which ended in a 3-0 quarterfinal exit to Iran. Du is well acquainted with the difficulties facing the national team, with his appointment as deputy sports minister in October placing him in charge of the Chinese Football Association. He is confident his new role will better equip him to transform soccer in China. "Through the platform, I aim to introduce advanced soccer management methods and experience to China," said Du. "We need to build a development model for China that fits the pattern of soccer development worldwide, but is also tailored to China's current position. "I believe that during my term with FIFA, and with the help of my colleagues in the CFA, Chinese soccer will continuously improve and develop in the future." Du added that the CFA has been working closely with FIFA, with the two organizations establishing a joint working group that aims to nurture soccer talent and boost the technical development of the sport. The last Chinese person to hold a high-ranking FIFA position was Zhang Jilong. As a member of the FIFA Executive Committee, Zhang is credited with having played a significant role in China's qualification for the 2002 World Cup and helping the nation earn the right to host the 2004 AFC Asian Cup. Du's election is seen as a boost for China's bid to host the 2023 AFC Asian Cup. China last hosted the tournament in 2004, when it finished runner-up to Japan.